H. B. "Bill" Culpepper, 76, died Wednesday, July 28, 2004 in a local hospital. Graveside services will be 11 am Saturday at Dudley Cemetery with Frank Chrane officiating, directed by Elliott-Hamil Funeral Home, 542 Hickory. The family will receive friends from 6 to 7 pm Friday at the funeral home. Born June 7, 1928, Bill was a lifelong resident of Dudley, Texas. He retired after 26 ½ years as a parts man with International Truck & Engine Corp. He was a Mason with the Clyde Lodge #1056. Survivors include his wife, Nancy; two daughters, Karen Henley and husband, Bob of Eula and Debbie Smith and husband, Curtis of Eula; three step-children, Benny Bryan, Bobby Bryan and Nancy Bryan, all of Abilene; four grandchildren, Mitch Henley, Kacee Henley, Craig Smith and Chad Smith; several step-grandchildren; and four great-grandchildren. 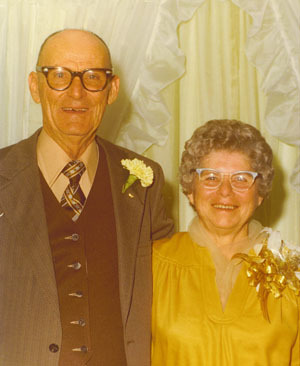 Johnny Max Downing and Nelda Mae Culpepper had two children born in Taylor Co., TX: Gregory John Downing (1960) and Tammy Mae Downing (1962). Nelda Culpepper, 29, married Glennon A Schloemer, 22, on 20 Jul 1971 in Taylor Co., TX. Obituary of Nelda Culpepper Downing Akes, published 11 Nov 2003. Vicky Diane Culpepper, Female, born __ 1972 in Taylor Co., Texas, child of Gary Lee Culpepper and Lucinda Diane Haupt. Michelle Lee Culpepper, Female, born __ 1972 in Taylor Co., Texas, child of Gary Lee Culpepper and Lucinda Diane Haupt. Robin Lee Culpepper, Female, born __ 1984 in Taylor Co., Texas, child of Gary Lee Culpepper and Teresa Iduma Starling. E-mail written Nov 2005 to Warren Culpepper from Debbie Byrd Radford, e-mail address. Willie Clyde Culpepper, Dau, F, Wh, 10/12, sng, AL/AL/AL. Annie Perkins, Servant, Black, F, Unk, 19, sng, AL/UN/UN, Farm Laborer. Lula Culpepper died 4 Jul 1910 in Pike Co., Alabama. + Lula Culpepper, 3 Oct 1880 - 4 Jul 1910. Annie Mae Culpepper Austin, Dec. 15 1900 - Sept. 18, 1948. Sunday, June 30, 2002, page B2. James M. Culpepper (16) married Anna Pearl Singleton (18) on 8 Mar 1919 in Pike Co., AL, Book W-231. Obituary* 24 Aug 1988� Mrs. Jessie C. Dease, 75, a resident of Rt. 1, Perote, AL, died Thursday, August 18, 1988 in a Montgomery hospital. Funeral services were held Saturday, August 20, 1988 at 2:00 p.m. from Zebulon Baptist Church. Rev. E. T. Horton and Elder Gilbert officiating. Burial was in Ramah Cemetery. Obituary of Jessie Lee Culpepper Dease (#11278), published 24 Aug 1988.